 With the See N Solve Calculator, children become familiar with fractions.  Calculations shown on large display screen. The See N Solve calculator made by the company Educational Products is designed for elementary and middle school students. What’s great about this calculator it is that it teaches students about fractions and helps them solve fractions. If your child is struggling in math and doesn’t understand fractions, this is a perfect product. The calculator is easy to use. Children can also use this calculator to add, subtract or multiply fractions (and divide them as well). The calculations are shown on the large display screen which makes the calculator not only easy to use but also helps learn about fractions. 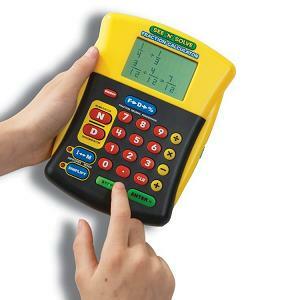 By using the calculator, children become familiar with fractions and learn to solve fractions.